VBS Direct Ltd - V-PET - A New Innovation - Innovative solutions for the veterinary professional. V-PET replaces the previous C-PET and E-PET products with a combined and improved product that can be used on both companion animal and equine patients. V-PET is a platelet therapy modality that can be used in the treatment of osteoarthritis, damaged and poorly vascularised tissues (e.g. tendons, ligaments and cartilage) that usually do not heal or only very slowly, and often with scar tissue formation resulting in chronic pain and reduced range of motion. 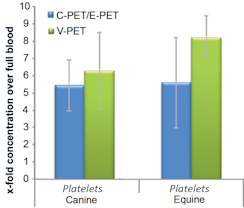 V-PET's patented filtration system gravitationally separates out the patient’s autologous platelets from its own blood and provides a rapid, sterile, concentrated platelet sample for injection into the damaged tissues. The selective use of platelet concentrate supports in a natural way the body’s regeneration and promotes long-term pain relief and mobility, though the release of the platelets’ natural anti-inflammatories, growth factors, cell differentiators and stem cell attractants. The selective use of platelet concentrate, which is obtained from the patient’s blood, supports in a natural way the body’s regeneration and promotes long-term pain relief and mobility, through release of PDGF, TGF-ß, IGF, EGF, FGF, PDEGF, PDAF into the recipient tissue. Pall is a global leader for more than 60 years in entrepreneurship, innovation and reliability. Pall technologies accompany us in daily life: whether in aeronautical engineering, microelectronics, biotechnology or medicine, Pall filtration systems guarantee the highest quality.